I have to inform you that with immediate effect following a meeting of the National Committee on Sunday 17th September 2017 Jim Mullen is no longer the Ring Secretary and that interim arrangements are in place until the post can be advertised. The Committee would like to thank Jim for his work. Graham Giddings will take over the role of Ring Secretary and will remain in post until a suitable successor is found, thus ensuring continuity during the main ring buying period thereby causing the minimum of inconvenience to Members. Graham, as a former NPA Secretary, is well known to many Members and is a ‘safe pair of hands’ to take over the role during this transitional period. The National Committee regrets that this change is necessary and is working to minimise any difficulties, which might result from the decision. Please be assured that the National Committee is working closely with the Secretary/Treasurer and interim Ring Secretary to ensure that Members do not experience any problems. The email address for the Ring Secretary remains the same and has been transferred to Graham whose phone number is 01458 851617. New membership/ring order forms for 2017/18, and new transfer forms are being produced and will be inserted into your next edition of Fancy Pigeon World which you will receive shortly, please ensure that you dispose of any previous forms, as using these may cause delays. Using the new forms will ensure you receive your rings with the absolute minimum of delay. If you have already sent in your membership form & ring order for 2018 rings rest assured that these are in hand. New forms can be found in the Download section of the website. If you have any concerns or questions regarding these changes please do not hesitate to contact any Committee Member, Graham Giddings or myself for clarification. The National Committee regrets that this change is necessary and is working to minimise any difficulties which might result from the decision. Please be assured that the National Committee is working closely with the Secretary/Treasurer and interim Ring Secretary to ensure that Members do not experience any problems. On the reverse of this letter you will find the contact arrangements for both Graham and myself - the email address for the Ring Secretary remains the same and has been transferred to Graham. New membership/ring order forms for 2017/18, and new transfer forms are enclosed – please ensure that you dispose of any previous forms, as using these may cause delays. Using the new forms will ensure you receive your rings with the absolute minimum of delay. If you have already sent in your membership form & ring order for 2018 rings rest assured that these are in hand. Show reps are there to assist the Show Secretaries with any queries that arise during the show day and offer advise if required. Contents on what the show reps will look at can be found on the form by clicking the link below. This year will see the reintroduction of random ring checks. The committee took the decision at Aprils committee meeting, based on correspondence with one of our members, Andrew Stables, regarding membership numbers. We decided to conduct a survey on people who were members of the NPA during 2013 or 2014 but as of April 2016 had not re-joined the NPA. We hoped that this would help understand the reasons why people join for one maybe two years then don’t re-join the following year, also allowing those lapsed members to voice their reasons for not re-joining. I divided and distributed the list of names out between the whole committee to contact in their own time and at their own expense, the categories that survey was broken down into was decided and has been used to collate the results below. 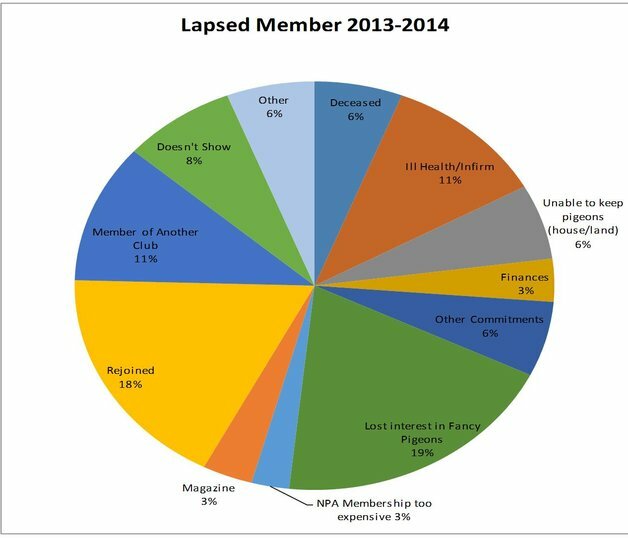 The list of lapsed members total 271, please be assured that this not as worrying a figure as it sounds, the NPA always has a certain amount of people leave and new people join each year. We are aware that membership is falling but again this survey may also shed light as to why, plus we are also aware that membership in general is falling across some other livestock associations. We wish to be open and transparent so therefore share the information with you all and as you can see the results are interesting. The committee have taken criticism regarding the decision they made in the best interest of the fancy over the past couple of years, i.e. publishing our own bespoke magazine. The committee will be looking into the results and may conduct further surveys with our 2016 members. The National Committee of the National Pigeon Association has written to all NPA affiliated Flying Breed clubs which issue closed rings for flying breeds. The Committee would remind affiliated clubs and Societies that they must adhere to the NPA and EE Rules; and I am asked to advise that rings issued specifically for Flying Breeds are not to be used on any other breeds, and such birds if entered in non-flying breed classes at shows will be disqualified. We also reminded Clubs that rings may not be issued before January 7th of each year thereby ensuring that only birds bred in the current year can be shown in Young Bird classes. Due to circumstances beyond the control of the BPSS who have hosted the NPA National Show at Pickering showground for the past few years, I was informed by e-mail on Sunday 29th May by the hall’s owners that the hall near Pickering could not be used for our championship show this year, even though it had been booked 2 years previously. This cancellation is due I am led to believe to “improvements“ being made. The BPSS committee were therefore left with the difficult decision to either find a new venue at very short notice or to cancel the show altogether. I can now confirm that an alternative hall has been found at York Auction Centre at Murton on the outskirts of York, a few hundred metres from the A64 York bypass. This venue is about 22 miles nearer the A1 than the Pickering hall is and hopefully will mean many exhibitors who had booked hotels in the Pickering area will not lose deposits. Obviously though York has a vast amount of hotel accommodation, plus all the amenities that historic City has. It was felt by the BPSS committee that if at all possible a show should go ahead this year, so contrary to any rumours that may have surfaced, the NPA National Show hosted by the BPSS will definitely go ahead as usual on the same date as planned, 3rd & 4th December. Most of the show should be single tier, there is plenty of parking and a very good cafeteria on site. There will not be any Poultry at the show. Over the past few years it seems that some members have got out of the habit of transferring birds they have bought, or been given, into their own names. It is a requirement that all birds shown are registered in the name of the owner, however during routine checking of show returns it became apparent that at each show 16%, or more, of the certificate winners had not been transferred into the exhibitor’s name. According to the Rules these bird should have been disqualified and the certificates cancelled! Many lost pigeons reported by members of the public have not been transferred to the new owner, and in some instances it is difficult to get anyone to take responsibility for the birds. According to the NPA rules the registered owner is responsible for collecting the stray pigeon, if the bird hasn’t been transferred then the original owner is responsible! It really does make sense to transfer all birds!! The Management Committee has considered this problem and, in view of the number of birds involved, decided to take no action - had the NPA fully implemented the Rules it could have been seen as being ‘heavy handed’ or ‘unreasonable’ and would have antagonised many exhibitors. The Committee consider that the best approach is to give all members the opportunity to transfer birds they have either bought or been given, before implementing the rules. So, there is a breathing space until October, the beginning of the 2016/17 show season, giving all members the opportunity, and time, to transfer birds they have not bred into their own name – this also includes birds bred overseas which need to be registered with the NPA. From the commencement of the show season the rules will be implemented. (e)(i) All changes of ownership of any ring, or pigeon wearing a ring issued by this Association, should be notified to the Ring Secretary. No pigeon is eligible for exhibition by a new owner until the Ring Secretary has been notified of the change of ownership and the ring has been properly transferred to such new owner for a minimum of 14 days before the exhibition. All responsibility for the transfer of rings lies with the Vendor (seller). Responsibility of ownership remains with the person to whom the ring(s) were issued until such time as the transfer of ring(s) is completed. (ii) If a lost bird is reported by a non-fancier (i.e. member of the public), the owner must make arrangements to claim the bird immediately. Failure to do so may result in suspension/expulsion. If a lost bird is reported by another fancier, the owner should make arrangements to claim it within 14 days. Failure to do so will result in a final reminder to claim the bird sent by the Ring Secretary. Failure to claim the bird within a further 14 days may result in suspension/expulsion. The person whose name appears in the Association Official Ring register will be regarded as the owner for the purpose of claims for lost birds. (d) If a ring worn by any certificate winning bird is found not be registered to the exhibitor the certificate will be permanently withdrawn and deleted from NPA records. Any exhibitor who exhibits such a ring or rings on more than one occasion may be suspended/expelled from the Association. Transfer forms can be easily downloaded from the NPA website, or obtained from the Secretary either electronically or as hard copy. The charge for transferring birds is £1 for up to 3 birds on 1 form, thereafter 35p per bird. Ring numbers are registered to the owner so that ownership can be authenticated. It really is in the interest of all Members to ensure that all birds are transferred to new owner, thus ensuring that there is an easy and accurate trace of ownership. PayPal is all working again now, apologies for any inconvenience caused while it was off line. Following on from the recent Show of the Year held at Blackpool there have been various comments brought to the committee’s attention from our members and ex committee members. We are well aware that some maybe hearsay, Chinese whispers but we feel that it is only right to state our position on the matters, these comments referred to our members and committee. We can confirm that no members have been disciplined by the NPA for cheating at Blackpool in 2015 or at any other Championship Show held under the NPA banner. We have been made aware that some of our well respected fanciers who chose not to show at Blackpool were perceived in this negative light. Please be assured that all the committee members dedicate their time to serving the Fancy & take pride in doing so, we are all here to serve you the members and will act of matters brought to our attention. Also to clarify the situation regarding NPA status for the 2015/16 season, we can confirm that no NPA certificates were applied for by the secretary of the National Young Bird Show, Nottingham and Blackpool. It was made clear to the committee that these shows would not adhere to the Rules & Constitution that allow the awarding of NPA Certificates.